..absolutely a take-your-breath-away moment of stunning beauty. 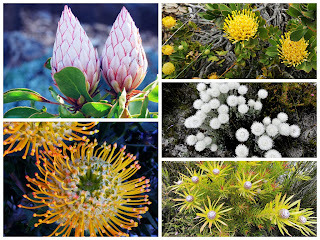 inside the Table Mountain National Park. a World Heritage Site just outside of Cape Town. This protected 7750 hectares area is home to a rich collection of fauna and flora. We saw many people cycling around the Park, it could be a great way to explore the area. The Park is also dotted with scenic walking trails for visitors with a little more time, too bad it is not for a tourist like us rushing from one viewpoint to another. There aren't any large animals in the Park, pincushion flowers and white paper flowers are blooming everywhere. It should be the best time visiting the park here at the end of Spring and Summer season just start. Views from inside the coach really wonderful. Views on the way up towards the Lighthouse are gorgeous. The seascape views across the Indian and Atlantic take my breath away: Oceans on two sides - Cape Point is situated on a peninsula. How many times we have this chance in our life? The original Cape Point Lighthouse was built on the Cape of Good Hope Penninsula in 1860. It was built on the highest point in the area and unfortunately it is too high and often shrouded by low clouds, not useful as an aid to navigation. In 1919, a new one built a short distance away but lower to the water. The old lighthouse is now a popular tourist stop for those visiting the Cape. This is where the famous Cape of Good Hope, at the southern tip, touches the water of two oceans, the Indian and Atlantic. 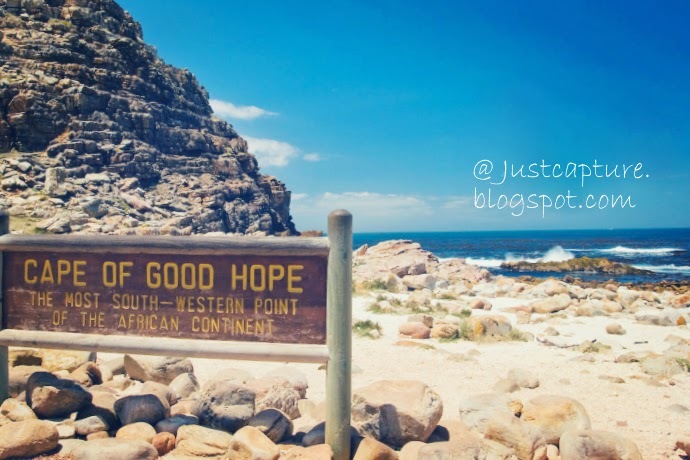 Despite its fame, the cape is only the third farthest south point in Africa. Two more points to the east reach closer to Antarctica. 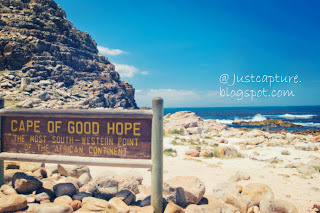 The Cape of Good Hope is the most south western tip of Africa. The first "modern" rounding of the Cape happened in 1488 by Portuguese explorer Bartolomeu Dias. Dias called the cape the Cape of Storms but John II later renamed it because of the optimism the opening of the sea route to India and the East was so great. The Cape of Good Hope is the home of The Flying Dutchman, it is a legendary ghost ship that can never make port and is doomed to sail the oceans forever. Anyway, it is too sad to think of it in front such a great views of the ocean. Cool rocks...I will share with you more The Cape Of Good Hope, South Africa whenever I have time to post.